Galleries located on the first floor include the Lillibridge Gallery, Abell Gallery, and the Rawlins Gallery. 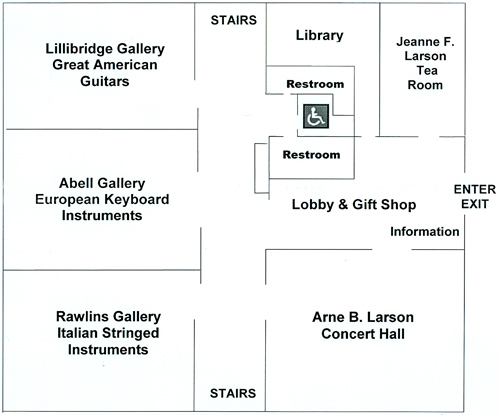 Also located on the first floor is the Arne B. Larson Concert Hall , the Jeanne F. Larson Tea Room, and the Information Desk. Hallway, lobby, and tea room displays include the guitar autographed for the Museum by B. B. King (first floor hallway) and "Treasures from the Joe & Joella Utley Collection of Brass Instruments" (first floor hallway). You are the visitor to this page since August 6, 2002.